Earth Idea Co. is an innovation lab that connects firms who produce waste with firms that need this waste to enable ‘value-added recycling’, otherwise known as ‘upcycling’. Their goal is to use upcyclers, researchers, and creators alike to crowdsource their ideas to bring to market. My role was to create and design a landing page to gather early adopter user base for future lead conversion. This was a solo project where I was responsible for both UX and UI. Create a landing page to gather early adopter user base for future lead conversion. By understanding the "why", design rationale becomes more impactful when communicated through visual language. Interviews with stakeholders were conducted, which involved a series of questions that identified adjectives to describe the overall brand - data that would later be used as foundational pillars which derived the UI elements. 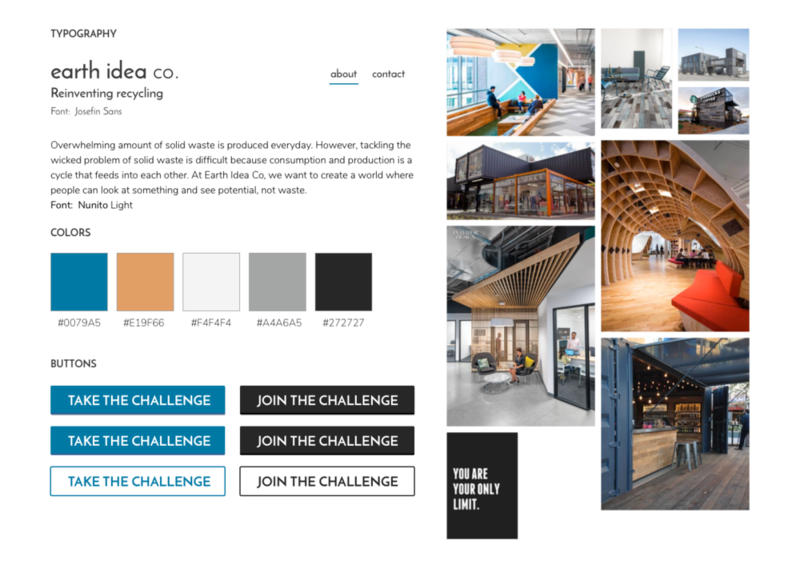 Style tiles were designed in order to explore two different design paths based on imagery collected through a moodboard, as crafted by data collected through interviews. Each style tile represented a different execution of visual elements, typography, buttons, and colors. Mobile first approach to wireframing allowed for a more focused approach in converting mid-fidelity wireframes into high-fidelity wireframes, especially in consideration of designing around content. It was important to design around content, as this landing page would be the primary portal where users learn about the brand/service, and ideally sign up as an early adopter.